"Amed is the place to escape the crowd. Unlike the beaches in the south chances are you will have the entire beach pretty much to yourself here. Just like Lovina in the north, Amed is not just one village, but a string of smaller villages located on a 10-km long road in the Karangasem province. It starts with the village of Amed in the north followed by Congkang, Jemeluk, Bunutan, Lipah, Selang, Banyuning and ending with Aas." Amed is famous for its beaches, lined with traditional outrigger fishing boats. There is quite coarse black volcanic sand beach at the village of Amed. Amed usually refers a long coastline of fishing villages. This stretch runs from the village Cucik about 14 miles to the east, where the seven villages are: Amed, Jemeluk, Bunutan, Lipah, Selang, Banyuning and Ace. The pace of life is slow here. The coastal scenery is very beautiful and that makes Amed the perfect place for a relaxing holiday in Bali. Amed is the latest development of tourism in Bali. It was only in 2000 that tarmac was laid on the roads in the region. Telephone lines were installed in 2003 and it took until 2007 before a bridge was built on part of the main road. The previous bridge was regularly washed away during the rainy season. The population of the area of Amed is living from fishing, salt production and tourism. The lack of tourism-based revenues, the remote nature and generally harsh conditions for agriculture, meant that this was an one of the poorest areas on Bali. Along with the recent development of tourism, this area has come a long way to improve. The overall standard of living, health and education was improved. Now the salt production is declining, but it's still an important industry in this area. If you drive along the coastal road, you'll see close to the villages large, dry salt pans with a crust of salt crystals. Those little boxes of gourmet Bali salt crystals you see in delis and specialty stores around the world have started their long journey in the salt pans of Bali. Most people come to Amed as a getaway, including the expats living in other parts of the island. It is a favorite honeymoon destination for tourists and is very popular with divers and snorkelers. The traditional outrigger boats are lying on the beach ready to sail on the sea. This normally means that they will sail out in the morning to catch fish: mackerel. Women from the local villages are always ready on the beach to give you an invigorating massage, specially on the beach at Lipah Beach. Enjoy nature and go with the wind on a traditional sailing boat for diving, fishing, dolphin watching, snorkelling or just for swimming or relaxing. The villages of Amed and Tulamben are fast becoming the best place to learn freediving (apnea or apnea diving) on Bali. Freediving schools are in Amed (Apneista) and Tulamben Apnea Bali). 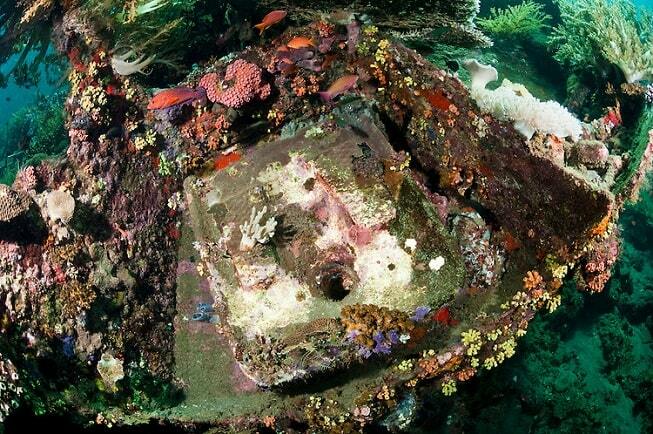 A real Japanese ship wreck lies in the village Banyuning and is ideal for diving and snorkeling. The wreck is located about 20 meters from the beach. There is an abundance of beautiful coral and many different fish. This dive site is under the local dive operators known as the "Japanese Wreck". To get there is easy. It is clearly marked and there is ample parking. Snorkels can be hired on the spot. 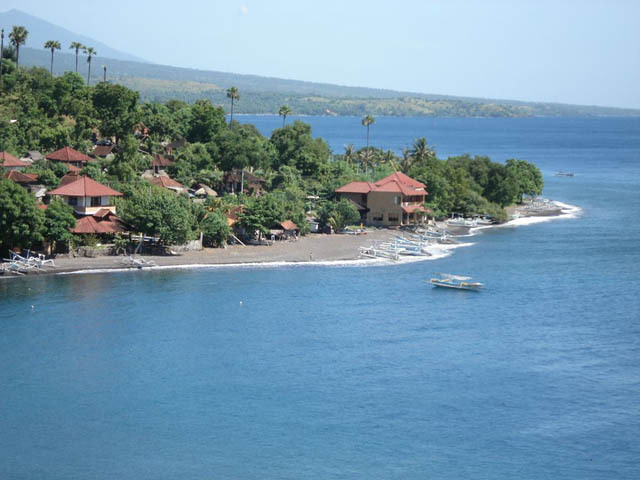 Tulamben is a small fishing village that is located 30 km north of Amed, about a 20-30 minutes drive. Near Tulamben lies the wreck of the USAT Liberty in the sea. The Liberty is a very popular diving site and if you actually stay in Amed or Tulamben, you have to dive to the wreck early in the morning. Later on it may indeed be very busy. The Liberty is a U.S. Army transport ship torpedoed by a Japanese submarine in 1942. The wreck lies about 30 meters offshore and is covered with soft corals. There is a huge range of reef fish and other species. Some parts of the wreck are in shallow water enough to allow snorkelling. There are some beautiful diving sites in Jemeluk Bay both from the beach and from a boat into deeper water. There are also beautiful coral off the coast. There are a few shops in Amed, which sell basic needs, as well as sarongs and T-shirts. Recently some shops opened with souvenirs. There are just three new ATMs opened in the area of Amed. You can withdrawn with Visa and Master Cards. There is also an ATM in Culik (a 10 minutes drive northwest of the village of Amed). The bank is the BRI and they accept Mastercard and amounts of up to 1.25 million rupiah. Larger amounts can be withdrawn at the stand-alone ATM on Jalan Diponegoro at the Hardy's shopping. For an evening drink and entertainment you go to the Double One Restaurant. Once per week there's a local band, which performs live. There are in some of the restaurants sometimes free Balinese dance performances. Generally Amed is quiet village at night and it is certainly not a late night drinking spot. Nestled in the heart of Amed, Tradisi Beach Front Villas is an ideal spot from which to discover Bali. From here, guests can enjoy easy access to all that the lively city has to offer. 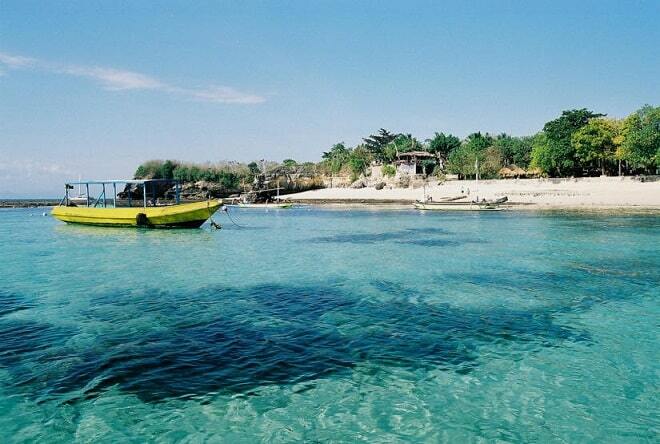 Also within easy reach are Amed Beach. At Tradisi Beach Front Villas, the excellent service and superior facilities make for an unforgettable stay. A selection of top-class facilities such as free Wi-Fi in all rooms, 24-hour front desk, luggage storage, Wi-Fi in public areas, car park can be enjoyed at the hotel. Tradisi Beach Front Villas is home to 7 bedrooms. All are tastefully furnished and many even provide such comforts as private pool, internet access � wireless (complimentary), air conditioning, desk, mini bar. The hotel's recreational facilities, which include private beach, massage, pool (kids), garden, water sports (motorized) are designed for escape and relaxation. Enjoy unparalleled services and a truly prestigious address at the Tradisi Beach Front Villas. Our destination was Bunutan, a neighbourhood in Amed filled with warungs (Balinese restaurants), and warm, welcoming homestays that provide modest bungalows near Bali�s best dive sites. If you�re a diving novice, Bunutan has a number of dive schools where you can take a class. Allowing myself to become comfortable in the deep blue, I learned to free-dive to 16 meters in the Bali Sea after a beginner�s course and guided practice. We continued west along the beach to the USAT Liberty Shipwreck to explore the site amongst sea creatures, snorkellers, and scuba divers. East of Bunutan is the Japanese Shipwreck, another popular snorkel site. Swimming only 20 meters from the beach, the shipwreck becomes visible quite suddenly. The fish and coral here are lively and vivid. For dining, we visited Warung Enak (highly rated by our dive instructors) multiple times. What are the ways of the Balinese? The staff at Enak not only provided delicious seafood and great service, but also noticed and helped us replace the flat we got on our car.